Discussion in 'Online Casino Promotions' started by Marina, Mar 30, 2015. 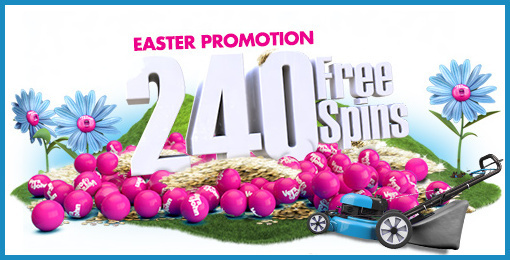 VeraJohn Casino has a nice Free Spins Hunt this Easter. Earn yourself up to 240 FreeSpins from 30th March to 6th April 2015. A deposit of €30 per day will earn a set of 30 free spins on some of their top online slots. Vera&John Casino will give 30 Free Spins for a deposit of €30 every day this week (30th March to 6th April 2015). There’s a different mystery game every single day and VeraJohn has hidden a few clues across their website. Join this plucky adventurer on his search for gold in the jungles of Peru! Watch out for Avalanche reels and massive multipliers! Well which videoslot could that be? I believe it is not hard to find out, especially if you love NetEnt Slots. Sweden, Norway, Finland, Netherlands, Germany, Austria, Australia, and the United Kingdom.